October 2, 2010 September 26, 2011 Elizabeth Ashworth3 Comments on So who really built the castle at Clitheroe? 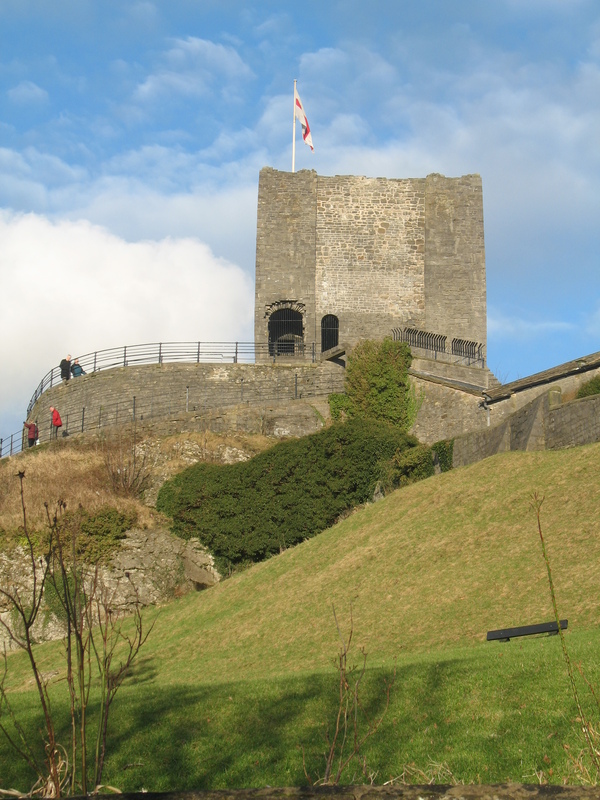 It has become commonly accepted that the castle at Clitheroe was built by the second Robert de Lacy in 1186, but there is compelling evidence that it was, in fact, built by the first Robert de Lacy between 1102 and 1114, which would make it over 70 years older. Robert de Lacy (1) was the son of Ilbert de Lacy (1) who was given lands that became known as the honour of Pontefract after the Norman conquest of 1066. Robert inherited these from his father and was also given lands in Blackburnshire which included the honour of Clitheroe after they had been confiscated from Roger de Poitou in 1102. It is probable that a castle of some sort already stood here. It may have been a wooden structure built by Roger de Poitou or even the remains of a previous fort held by Orme the Saxon. Around 1114 Robert de Lacy (1) was also banished from England by Henry I (possibly for some involvement in Robert de Belleme’s rebellion in support of the imprisoned Robert Curthose and his son William Clito) and the de Lacy lands were given to Hugh de Laval. Hugh confirmed a charter that gave income to the Cluniac priory of St John at Pontefract that had been founded by the de Lacys, and in it he refers to the chapel and tithes of his demesne of the castle of Clitheroe: ‘capellam Sci. Michaelis in Castro de Clyderhow’ – the chapel of St Michael in the castle at Clitheroe. The evidence for a much earlier castle being built soon after the conquest when the lands at Clitheroe belonged to Roger de Poitou can be found in the Domesday Book where it is recorded ‘Berenger de Todeni had held XII car. of land in that place, sed modo est in Castellatu Rog. Pictaviensis’. This would seem to indicate that Roger de Poitou had built a castle. It may have been a wooden structure as most of the early Norman castles were. If it was originally wooden then it was replaced by a stone building at a later date. But whether it was replaced by the first Robert de Lacy before 1114 or by the second Robert de Lacy in 1186 remains open to speculation but I prefer the earlier date. The main evidence for the castle being built by Robert de Lacy (2) comes from a document called Historia Laceiorum. This was written in the 15th century and was printed by Sir William Dugdale in his Monasticon Anglicanum – a history of all the abbeys and other monasteries in England, written in Latin. (Which isn’t helpful as I have to rely on translations). Dugdale linked this document to Kirkstall Abbey though there is no conclusive evidence that it was written there and other historians link it to Whalley Abbey as most of its information is regarding the Lacy lands to the west of the Pennines. The Historia does contain some known errors. For example Aubrey (or Albreda) Lisours is confused with her daughter of the same name and it misdates the death of Edmund de Lacy. So, although the document credits Robert de Lacy (2) with the building of the castle at Clitheroe, it could be an error and the writer, working many hundreds of years after the events, could have confused the two Roberts. I am a adopted Clitheroe age 70 and wanted to learn the history behind my birth name. Even though I found my late brother David Allen Clitheroe after all these years. But I found his daughter, but haven’t met yet, we do email each other. Now the history behind my name is very interesting. I’m planning to take a trip to England in the spring. At first I found it hard to believe I was name after Clitheroe Castle. At the moment I am righting a book called lost behind a Castle. Even though I live in Canada. I hope you find time to visit Clitheroe when you come to England. in the de Lacy domain.